The winning $560 million Powerball ticket was sold in Merrimack, NH, but still no word on who will walk away with the massive jackpot. The winning Powerball numbers drawn Saturday night were 12-29-30-33-61 and Powerball 26. An unidentified customer at Reeds Ferry Market in Merrimack, NH, is the winner of the $559 million Powerball jackpot. The winner is expected to take home up to $352 million. The winning Powerball numbers drawn Saturday night were 12-29-30-33-61 and Powerball 26. The Powerball jackpot was the nation's seventh largest. 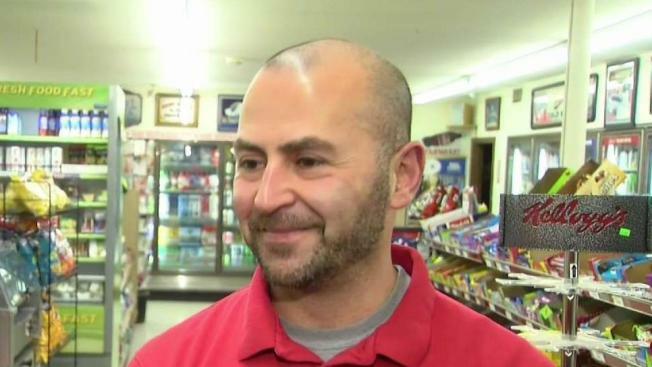 The owner of the New Hampshire convenience store that sold the winning ticket for the $570 million Powerball lottery jackpot says he is very excited and overwhelmed by the win. The owner of the convenience store says he is very excited and overwhelmed by the win. Reeds Ferry Market, located in southern New Hampshire about 25 miles south of Concord, will receive a $75,000 bonus for selling the winning ticket. Sam Safa says many of Reeds Ferry Market regulars have been stopping by since it opened at 5:30 a.m. Sunday to congratulate him and chat about the nation's seventh-largest jackpot. He says the store is a small, independent business over 100 years old. Experts predicted that the odds of winning the jackpot was approximate 1 in 292.2 million. It's been a billion-dollar lottery weekend after a lone Powerball ticket sold in New Hampshire matched all six numbers and will claim a $560 million jackpot, one day after another single ticket sold in Florida nabbed a $450 million Mega Millions grand prize. The Florida Lottery says the winning Mega Millions ticket was bought at a 7-Eleven convenience store in Port Richey. The retailer will receive a $100,000 bonus for selling the ticket. The identity of either winner was not immediately available. However, under Florida law, the Mega Millions winner cannot remain anonymous. The winner's name, city of residence and details on the winnings can be made public; however, the winner's home address and telephone numbers are to be kept "confidential."